Slugger Lee Dae-ho has inked a three-year deal worth 1.45 billion yen (nearly $14 million) with the Softbank Hawks of Japan’s Nippon Professional Baseball, multiple reports said Tuesday. With the new contract, the Korean first baseman ― who entertained thoughts of playing the U.S. Major Leagues ― will stay in Japan, joining the team after two years with the Orix Buffaloes. The contract is a so-called two-plus-one deal, which gives the player the right to extend the contract to a third year, and includes performance incentives. The Hawks ― looking to bolster their lineup ― get Lee after he had a solid year in which hit .303 with 24 home runs and 91 RBIs. 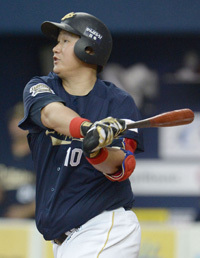 The Korean slugger rejected a three-year deal from Orix worth over 1 billion yen. The deal makes Lee the third-highest paid Korean player ever in the Japanese league following Lee Seung-yeop, who played with the Yomiuri Giants and Lim Chang-yong, who played with the Yakult Swallows. 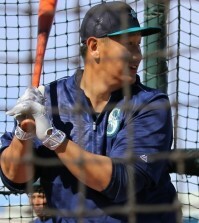 The slugger entered the Korean Baseball Organization in 2001 as a pitcher with the Lotte Giants. In 2006, he won the league’s Triple Crown, hitting .336 batting average, 26 home runs and 88 RBIs. 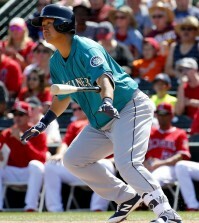 Lee’s stance is close to the plate, which gives him range to the outside part of the plate. He also has a knack for turning quickly on inside pitches.